Restaurants with cozy fireplaces and a selection of award winning wines to while away the winter blues. 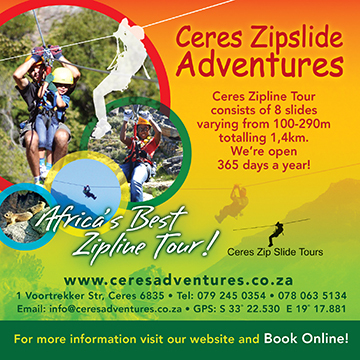 For the outdoor active put on the winter woolies and book an out-ride on horseback, a hiking trail, or even the Ceres Zipslide. Book your seat at our local theatre and sit back, relax and enjoy the show. Take a stroll down Church Street and experience three hundred years of history. This is the perfect time of year to get some great photographs so why not book a photographic tour with Norman Collins and he can show you where to take some of the best scenic shots of the Valley. Relax and unwind and just enjoy the beauty and tranquility of the Valley.